This is a handy technique for making a reversible, cushy fabric that has stockinette on both sides, along with a neat and tidy edge. Use this technique to make a seamless, cozy scarf, or a potholder/hotpad. I think the best way to bind off is in pattern (shown in the video); if you just knit all stitches for the bind off, the stitches become elongated and look funny in comparison to the rest of the fabric. Binding off in pattern will create a seamless end to the fabric. Do knit the last stitch rather than slipping it so that you can pull the tail through to weave in the end. Can you tell me how this pattern would be worked in the round (on circular needles) for a hat? Thanks. @Deborah Reardon, I haven't tried this in the round, but it don't think you have to change anything to do so. 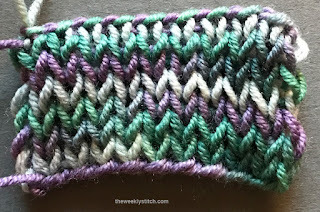 After working row 1, just work in the slip/knit pattern and it should work. Deborah, did you try this in the round? Because that is my question also. I want to use the double stockinette stitch for the sole on toe up socks! It is not working in the round 😢 - I am also wanting to use it for socks. First of all, great site! Keep up the awesome work! Now for a question: I'm an intermediate knitter I think... I can do intricate patterns and such, BUT I've never done anything where I had to pick up stitches and I think I would like to take on a log cabin blanket to clean out some stash... do you think this would make it more difficult to pick up stitches the first time? I just worked out how to do double stockinette in the round. The first round is as normal - (knit one, slip one with yarn in front) repeat to end with last stitch slipped; but then, because you don't turn the work, the next round needs to be the reverse, i.e. (slip one with yarn at back, purl one) repeat to end. 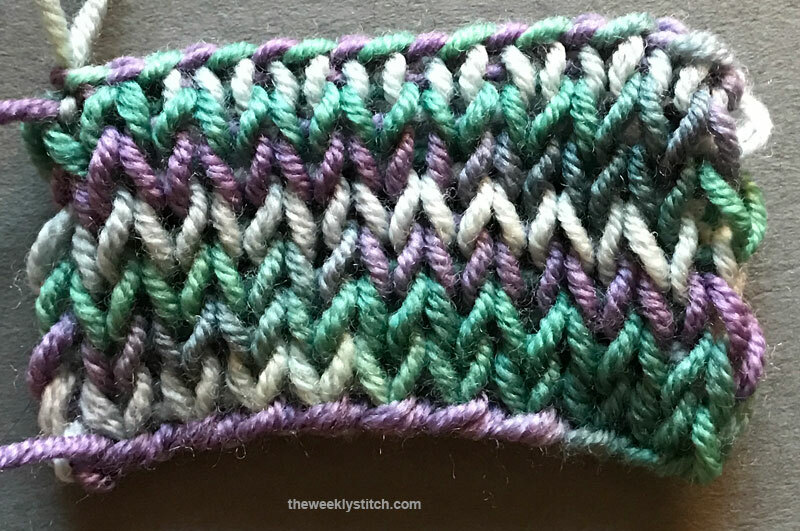 Tricky bit - when you go from a knit row, which ends with a slipped stitch, to a purl row which starts with a slipped stitch, be careful to have the yarn in front for the first and the yarn at the back for the second slipped stitch. Otherwise, its pretty straightforward. Watched and loved, loved the stitch !!! Had to give it a go in the round....works and looks great, k1, Slip 1 with yarn in front on all rows......looks the same as on straight needles. Love the round as well as it looks the same.